Just a quick post today to tell you all about the amazing scran (Geordie for food) at Puro Beach in Marbella. Well it's more towards Estepona. Around 15 minutes away from Puerto Banus. Weather you want to go there for the day like we did (vlog coming tomorrow on that) or just for lunch. Puro beach caters for both. At 2pm after a million work phone calls we decided it was lunch time. I needed a break from talking on the phone and pretend I was actually on holiday and not just working from the beach. We started as all good meals do. R ordered the Thai green curry, no vegetables with extra spice. 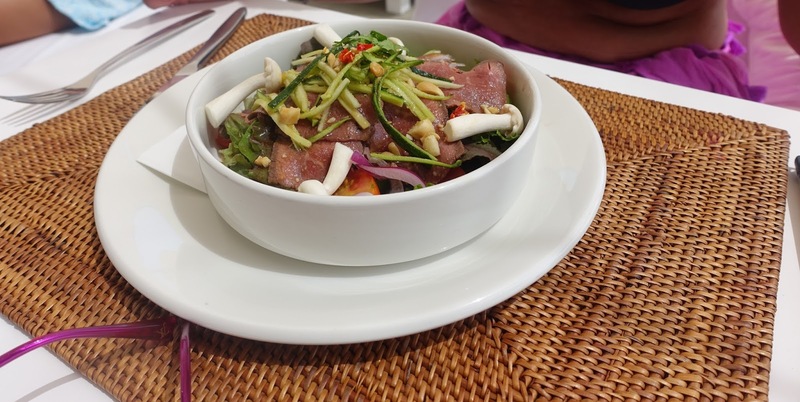 J had the most beautiful Thai beef salad. It looked and tasted so good. I got something I have never tried before. The Nasi goreng. Staty chicken skewer with an egg omelette, slices of cucumber on a bed of rice mixed with prawns. The scran was amazing. Sadly this was my last beach trip for this year. I'm so sad summer is almost over. But on a brighter note today is the first day of September. My birthday month and yes, I am going to try and drag my birthday out for a month.